Is 5G the missing link to a perfect IoT? 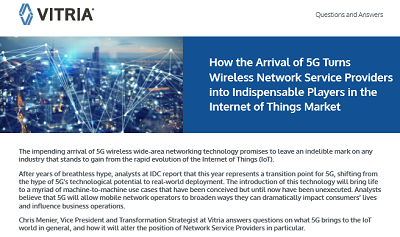 In this Q&A, Chris Menier, Vice President and Transformation Strategist at Vitria, addresses the impending arrival of 5G wireless WAN technology and what it could mean for network service providers (NSPs) and the rapid evolution of IoT. Download the Q&A, and learn why this industry expert is calling 5G the “key enabler of IoT.” Plus, discover how this emerging technology could increase the capacity for machine-to-machine communication while changing the position of NSPs forever.